NADA 2018 – In the Books! Streamlining the financing process to faster funding. 700 Credit is pleased to announce our enhanced integration of our credit and compliance platform with CU Direct’s new CUDL lending platform. CU Direct, a provider of lending software technology and automotive solutions for credit unions, released the redesigned platform in 2017 specifically with dealers in mind. Additional integration between 700Credit and CUDL includes the ability for 700Credit to push data into the CUDL platform. The new CUDL platform empowers dealers to sell more cars, with an improved interface and simpler navigation. The platform has been enhanced to make it easier than ever for dealers to access pre-approvals, get instant decisions on applications and receive faster funding. Integration with the new CUDL platform is a natural progression to our long partnership with CU Direct. We have been partners for many years and truly appreciate the relationship. The integration between the new CUDL platform and our credit and compliance solutions provide dealers with a seamless workflow and quicker deal close. As a result, dealers now have a solution that provides true two-way integration capabilities, eliminating double entry of customer data, and further streamlining the entire application process for both dealers and credit unions using the CUDL. Stay tuned for more information on this exciting partnership! Dealers benefit by having customer FICO® score and auto tradeline data to work smarter deals earlier in the sales process. 700Credit is also pleased to announce an exciting new relationship with Edmunds, the leading car information and shopping platform that helps millions of visitors each month find their perfect car. With this new alliance, Edmunds will incorporate the 700Credit’s pre-qualification platform into the consumer car shopping experience on Edmunds.com. The integration of the 700Credit pre-qualification technology will enable Edmunds to send just a name and address to 700Credit to run a soft-pull on the online shopper. Edmunds in return will receive the consumer’s live FICO® score and information on all open auto tradelines including monthly payment, interest rate and remaining balance. This will also enable Edmunds to provide consumers with accurate car payment quotes instantly based on the vehicle they interested in. Consumers are spending more time than ever shopping for vehicles online. Not only do they want to find the right car, but they also are looking to move further down the sales process before stepping into a dealership. By providing soft-pull data to dealers earlier in the process, consumers can be offered proposed monthly payments and interest rates sooner – when they are still online deciding who they will buy their vehicle from – encouraging them to purchase at the dealership making the offer. 700Credit is pleased to announce the release of our new Score Summary Dashboard! This new feature will be automatically enabled to all our customers for no additional cost. The Score Summary dashboard provides our clients with a single, graphical view of each of the credit bureaus and scores they pull on their customers, without having to scroll through each report for this information. The dashboard will appear below the Red Flag Summary and above the Credit Report. If there are multiple scores being returned, the first two scores are displayed. The first score will be included in the ‘big’ dial, the second score will be represented immediately below the dial. Dealers have the option to turn off the Score Summary Dashboard if desired, by emailing support@700Credit.com . Recent studies have proven that dealers who pull more than one credit score on consumers have higher closing ratios and higher gross profits than dealers who pull only one score. Did you know dealers have a greater chance of pulling a higher score when the initial score is low? In a recent study 55% of applicants with 2 credit bureaus pulled have risk scores that vary by more than 20 points, and the variance increases to over 30 points when all three scores are pulled. In this session we will discuss the statistics and talk about how you can make the most of multi-bureau pulls at your store. NADA 2018: A HUGE SUCCESS! 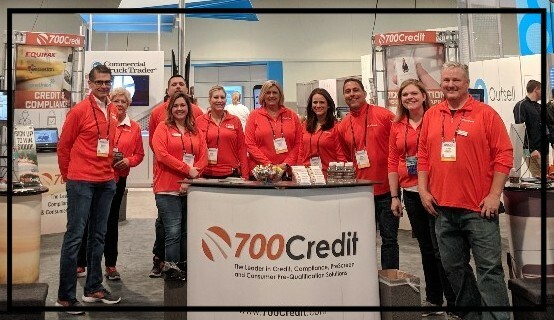 700Credit would like to thank everyone who visited our booth in Las Vegas this year at NADA and joined in our success. We doubled our footprint and more than tripled our visitors and we have you – our clients and partners – to thank. Many of you stopped in to say hi and it was great to put a face to the names we talk to every day. See you at NADA January 2019 in San Francisco! We are hosting our first-ever Dealer Summit! This will be a great opportunity to mix and mingle with other 700Credit dealers and share best practices, tips and techniques for making the most of our products and services. 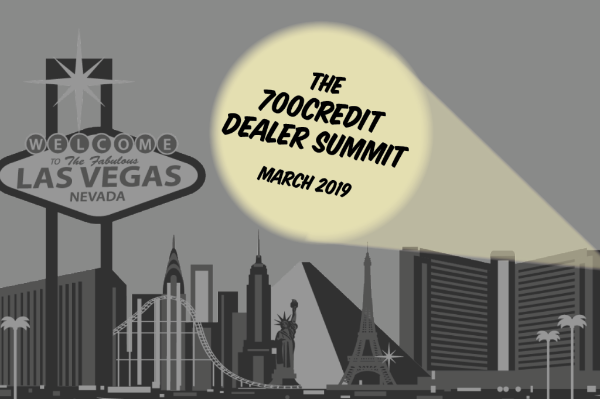 You will also have behind-the-scenes access to the 700Credit team as well as many of our software partners including: CRM, DMS, ILM, direct marketing, lead generation, websites and much more!